For additional lodging options to fit your accommodation needs, see our Hotels & Motels and Bed & Breakfasts pages. It’s a nature lover’s paradise! The rustic charm of a log cabin with all the amenities you would expect in a comfortable family home. The property features a 2150 square foot, 4 bedroom, and 3.5 bath well-appointed log home on 40 acres of prime driftless area land with hiking trails leading through rock cliffs, pollinator prairie and oak savannas. With our homestead-inspired simplicity, you’re sure to enjoy any stay with us, whether you’re here to attend one of the many area festivals or just relaxing. We are located in the hills west of New Glarus, a mile off the paved road, but you won’t feel isolated unless you want to be. Two-night minimum; weekly rates also available. Accommodates 1–6 people, children stay free. The Lodge address is Blanchardville, but this property is very close to New Glarus. For more information visit our website. 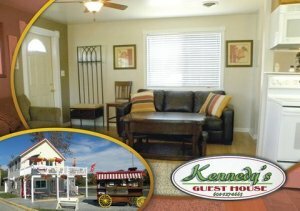 Kennedy’s Guest House offers all the comforts of home to enjoy your vacation! Amenities include an open air view of New Glarus from the edge of our downtown district. Newly updated with a free flowing floor plan. A full kitchen, large bathroom, a queen bedroom with two living room sleeper sofas to accommodate up to five. Enjoy the ample deck with a barbecue grill and comfortable seating. Located above Kennedy’s Ice Cream & Grill, the park and pool across the street and being on the Sugar river trail head, come for fun, hiking, biking or snowmobiling and enjoy our town's charm. The Little Sugar River Farm is a vacation rental on 20 acres of garden and orchard close to two bike trails. The property is secluded, surrounded by 2000 acres of wildlife refuge, and ideal for people who want to bike, hike, run, bird, read, and relax. The guesthouse is less than a quarter of a mile from the 23-mile Sugar River Trail, and five miles from the Badger State Trail. Both trails wind along rivers, through rolling hills, forests, and wildlife areas. The New Glarus Farm House is located amid rolling hills 5 minutes west of New Glarus, WI, home of "America's Little Switzerland." It's approximately 35 minutes from Madison, WI, and less than 3 hours from Chicago. Located on 700 acres of farmland and woods, the Farm House is nestled in a peaceful valley with a long driveway, miles away from the busyness of everyday life. It's a place to get away from it all, reconnect with your family and friends. With 4 bedrooms (2 queen and 3 full-size beds), we can accommodate large groups in this country home of yesteryear. For more info, rates and photos, visit newglarusfarmhouse.com. Perfect location right downtown by the Village Park and Swiss Church. Park your car and walk to all the restaurants and entertainment. The property is a newly remodeled first floor two bedroom apartment that opens right out to the park. Bring your bicycles and ride the Sugar River or Badger State Trails. Secure bicycle storage is available. Two day minimum stay if booking on a weekend. Spacious 3 bedroom, one bath home away from home in "America's Little Switzerland." Located at the center of everything New Glarus has to offer....walking distance to great restaurants, bars, shopping, festivals and bike trail! Private parking available. Easy access to everything New Glarus has to offer, private deck and private parking! Large kitchen opens into the living area with ample seating. Suitable for a family or group of friends. Master bedroom features a queen sized bed. River Cottage is ideal for a romantic weekend, a friends’ getaway or a family vacation. Located along the Sugar River on the edge of the Village of Albany, you’ll find River Cottage, a fully refurbished 1912 craftsman cottage. The eight room air conditioned cottage can easily accommodate 2-6 people. A first floor bedroom includes a queen sized bed and attached private bath. A queen sized luxury sleeper sofa is available for larger groups. The second floor bedroom suite features a king sized bed, full bath and fireplace. The cozy spa room on the first floor includes a double whirlpool tub and fireplace with comfortable lounge chairs to relax in. Other features include a living room with satellite TV, dining room and a three season porch. The fully equipped kitchen has a dishwasher, refrigerator, stove, microwave, coffeemaker and toaster, as well as dishes, cutlery and pots and pans .The grounds offer a patio with gas grill and plenty of room for hammocks, volley ball, and croquet. A winding drive through the woods takes you to a beautiful European inspired house on a hill over-looking the countryside. Vines & roses climb the exterior of the house, thus its name "Rose Hill." This country inn is located in New Glarus, WI, amongst the rolling hills of Green County. We strive to make your accommodations something you will keep in your favorite memories. And we trust you will want to return again to our lovely bed and breakfast. Escape to Peace & Solitude! 5-BR Renovated & Secluded FARM HOUSE located in the beautiful driftless area of the state. Near beautiful communities such as New Glarus, Mineral Point and so many others.